"Tunguska" the AZGS map store's mammoth mascot, was profiled in the Arizona Daily Star today. She's actually a museum-quality reproduction of a 1-year Siberian wooly mammoth, on loan from the Museum of Natural History in Novosibirsk, Russia. Her name was the winning entry in a kids-only contest held during the Tucson Book Festival [right, my photo] where she was a big hit with kids and their parents. The fiberglass body is covered with fur from an Altai yak, arguably the closest existing fur to what a real mammoth would look and feel like. There's a lot of updates there to what's in my 1969 copy of "Ghost Towns of Arizona" from University of Oklahoma Press. 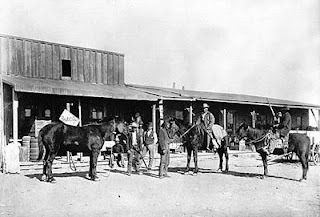 There's also Ghosttowns.com with links to 275 Arizona ghost towns. The report of the blue ribbon commission on nuclear waste is calling for "A new organization dedicated solely to implementing the waste management program and empowered with the authority and resources to succeed," including development of one or more geologic disposal facilities and one or more consolidated interim storage facilities. The commission calls for "a new, consent-based approach to siting future nuclear waste management facilities," which implies finding a host locale that will accept or even invite it. 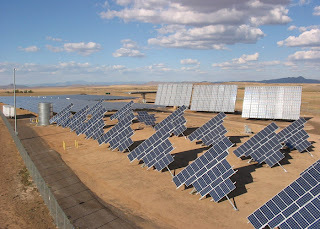 Arizona State Senator Al Melvin (R-Marana) has been advocating putting a high-level waste site in Arizona along with a fuel reprocessing facility. The article also notes that North American potash inventories at the end of June were 26% below the average of the last 5 years. There is a worldwide race on to develop new potash mines to meet demand, but there are concerns among some analysts that there could be an overcapacity down the road. 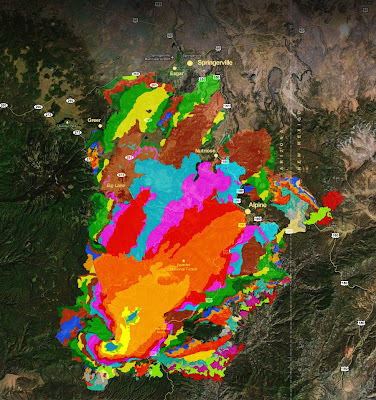 Arizona's Holbrook basin deposit is currently a center of intense exploration by at least 3 companies. The deposit is one of the shallowest known, is close to rail and an interstate highway, and could help meet U.S. demand. AZGS is working through the Association of American State Geologists to digitize data relevant to geothermal energy from all 50 states, create a national distributed data network, and link it into the National Geothermal Data System. ASU is running "most epic big science project in the universe"
Popular Science magazine has declared the EarthScope [top right, credit EarthScope] project to be the most epic big science project in the universe. And Arizona State University's School of Earth & Space Exploration (SESE) took over on July 1 as the host university for the EarthScope National Office. Popular Science took into account four objective factors: the construction costs, operating budget, the size of the staff and the physical size of the project itself. Three subjective factors were also added in: the project’s scientific utility, its utility to the average person (“what will it do for me”) and the “wow” factor. The USArray component of EarthScope deployed 58 broadband seismometers across Arizona in the early stages of the project before rolling them eastward as part of the nationwide experiment to characterize the North American crust in 3D. 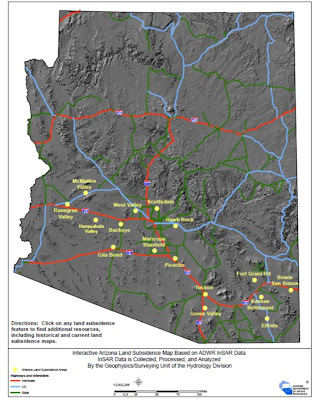 AZGS in partnership with ASU, NAU, and UA and funding from FEMA, acquired 8 of those stations, which now form Arizona's first statwide seismic monitoring network. SESE says that "landing a spot on Popular Science's Big Science list served as reminder to look back and recognize the School of Earth and Space Exploration participation in several other monumental projects. Over the next few days, you can send in your suggestions for projects that should be considered for SESE’s “Top 10 Epic Projects” list. Please send your suggestions to Nikki Cassis either via email or on Facebook. Check back early next week to view SESE’s “big science” list." And in another linkage, I was on the external panel that reviewed and recommended funding of EarthScope to the National Science Foundation. The Politico.com Energy Report website says, "Top Democrat appropriator Norm Dicks thinks his party has a “decent shot” to vote down an Interior-EPA spending bill rider that would prevent the Obama administration from blocking new uranium mining on public lands surrounding the Grand Canyon." The rider was introduced by Rep. Jeff Flake. 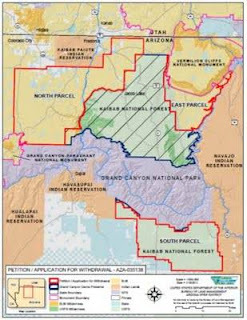 Meanwhile, in an opinion piece ("GOP lawmakers have Canyon under siege") yesterday in the Arizona Republic, Congressman Raul Grijalva raised the specter of mining taking place in the Canyon itself, saying "Arizona doesn't want to open the Grand Canyon for mining, drilling or any other kind of disruption. The Canyon isn't just a pile of rocks or a vein of minerals waiting to be turned into cash." The million acres of federal lands under debate are actually BLM and Forest Service lands [right, credit, BLM] outside the national park boundaries, but there is widespread public perception that mining is proposed inside the park and inside Grand Canyon. update 8pm: Keiran Suckling, Executive Director of the Center for Biological Diversity, warns in an op-ed posted this evening, that if the House Appropriations rider passes, "The place that millions consider a national treasure could become a radioactive industrial zone." note: for some unexplained reason, the last half of this post was not showing up when it was posted online. The only way I can get it to appear is to disable the live links to the sources. First time I've had this happen. 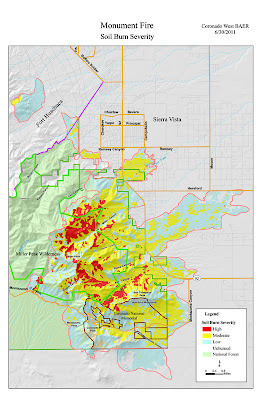 The Wallow wildfire is the largest in state history and the Arizona Republic newspaper has compiled a striking set of maps showing the day by day growth of the fire. The one at right is the last in the series, with each color showing the acreage burned on one day. Clicking through the set demonstrates how quickly the fire swept across the region in its early days. Kudos to the Republic for a pulling this together. The USGS has published results of the most recent high flow experiments on the Colorado River to rebuild sand bars below Glen Canyon Dam. 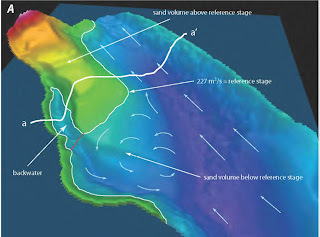 They found that "Each of the controlled floods resulted in sandbar deposition that was followed by erosion in the 6-month post-flood period. Erosion rates are positively correlated with post-flood dam release volumes and negatively correlated with post-flood tributary sediment supply volume." 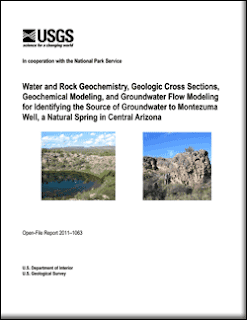 The USGS has issued a new report on the geology, geochemistry, and groundwater of Montezuma Well, the eponymous center of a national monument but they acknowledge that more information on the geology, surface water, and groundwater flow is needed to test the conceptual ideas they have on how the system operates. "The source of water to Montezuma Well, a flowing sinkhole in a desert setting, is poorly understood. Water emerges from the middle limestone facies of the lacustrine Verde Formation, but the precise origin of the water and its travel path are largely unknown. Some have proposed artesian flow to Montezuma Well through the Supai Formation, which is exposed along the eastern margin of the Verde Valley and underlies the Verde Formation. The groundwater recharge zone likely lies above the floor of the Verde Valley somewhere to the north or east of Montezuma Well, where precipitation is more abundant"
Ref: Johnson, R.H., DeWitt, Ed, Wirt, Laurie, Arnold, L.R., and Horton, J.D., 2011, Water and rock geochemistry, geologic cross sections, geochemical modeling, and groundwater flow modeling for identifying the source of groundwater to Montezuma Well, a natural spring in central Arizona: U.S. Geological Survey Open-File Report 2011–1063, 62 p.
Earlier today, we had magnitude 2.4 and 2.o events nearby. update 7-27-11 4pm: all 3 quakes are now gone from the USGS earthquake page and list. We assume they decided they were not tectonic, ie, they are due to the lake filling? ?, and so deleted them. 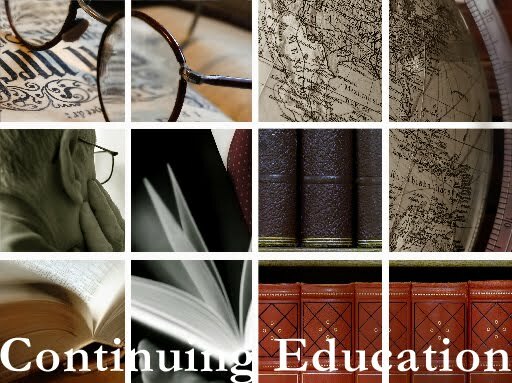 The Arizona Board of Technical Registration is considering a requirement for continuing education for maintenance of professional licensing of geologists. The Arizona Chapter of the American Institute of Professional Geologists has weighed in on the proposal, evaluating the benefits and costs, and effectiveness in states where similar measures have been instituted. Several States have indicated that they “believe” that CEU requirements help protect the Public, but each indicated that they do not have any data to support this belief. Several States indicated that they were just following the lead from the Engineering Boards when implementing the requirement and did not provide any justification for this to their legislatures. Most believe that CEU requirements help professionals stay current. 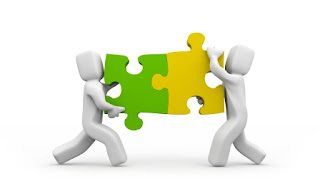 From a professional’s perspective staying current may provide an individual with an edge over the competition, and may increase the public protection and welfare in the process. However, having a CEU requirement for registrants has not been demonstrated to increase public protection and welfare and may add a significant burden to the Board in the administration of the program. In fact, twenty-two (22) of the thirty (30) ASBOG States have determined not to include a CEU requirement in the renewal of registrations. 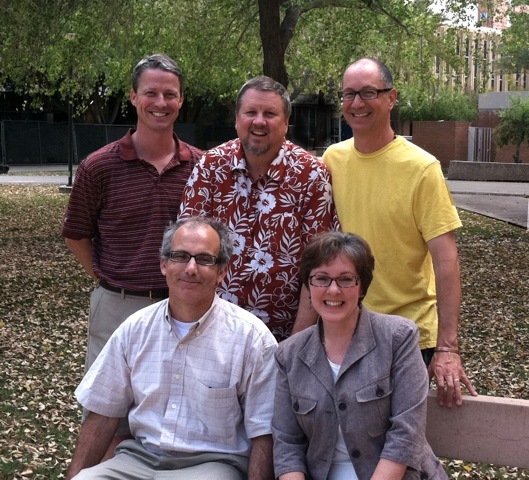 In Arizona it is rare that a Geologist appears before the Board. 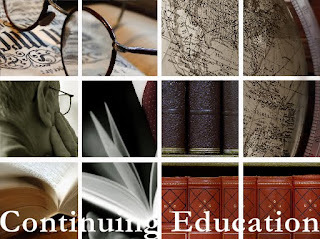 Adding a CEU requirement will not change this (except that the Board will have to evaluate CEUs every year adding to the administrative workload). There have been a number of similar sized quakes in this area for several months. Could they be due to the refilling of Lake Mead from spring runoff coming down the Colorado River? When a science story gets a mention on the Colbert Report along with the debt ceiling debate, it must be big news, right? Anyway, the ASU-run Lunar Reconnaissance Orbiter Camera has captured images on the far side of the moon of rare silicic volcanism. Woop, woop! The location is near a major transform fault separating two spreading centers that are tearing Baja California away from the mainland. So far, only a handful of reports are coming in of it being felt, including a few from Southern California. The U.S. House yesterday passed a rule for the Dept. of Interior appropriations bill, with a provision that overturns the ban on mineral exploration and mining on 1 million acres of federal lands in northern Arizona, imposed by Interior Secretary Ken Salazar. The bill, HR 2584, passed by a vote of 205-131. The affected lands are outside the boundaries of Grand Canyon National Park. updated 7-27-11 12:08pm - clarification that the House passed a rule, but not the actual appropriations bill. A home in nearby Hereford was also hit with flooding and reported mudslide, but Phil Pearthree, Chief of the AZGS Environmental Geology Section which handles natural hazards, cautions that the first floods after fires are notoriously full of ash, and people generally have no idea how much suspended sediment is carried by floods in our region. The AZ Dept. of Transportation reopened a section of highway 191, one of the few paved roads in the White Mountains, after it had been closed for a week due to a likely debris flow. Residents in the Wallow fire area are preparing for floods, mudslides, and debris flows as well. The good news is the National Weather Service has worked pretty hard to incorporate the greatly increased possibility of mass movements in the post-fire regime into their flood warnings. Phil noted that these stories and others really illustrate the fact that there is very little time to develop any mitigation measures between fire and the onset of the monsoon. So, counties and cities, let's try to plan ahead and anticipate areas that may be affected by fires and flooding in the coming years. Some of them seem to be getting that message now. 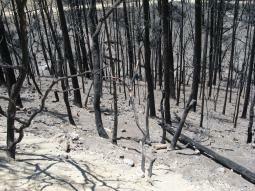 Coconino County has confronted that reality since last year's Schultz fire and subsequent flooding and rising concerns over debris flows. 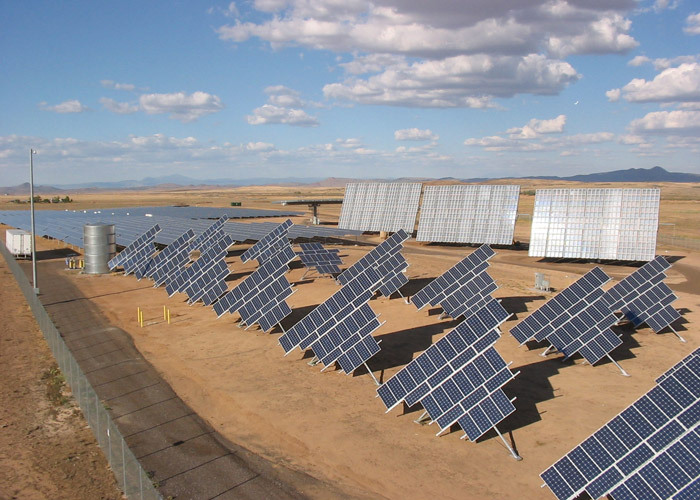 Tucson Electric Power came in 6th in the second category, Solar Watts per Customer, which measures the amount of new solar capacity installed, divided by the number of customers. TEP weighs in at 29.7 watts per customer, compared to top-ranked Silicon Valley Power (CA) with 39.9 watts. 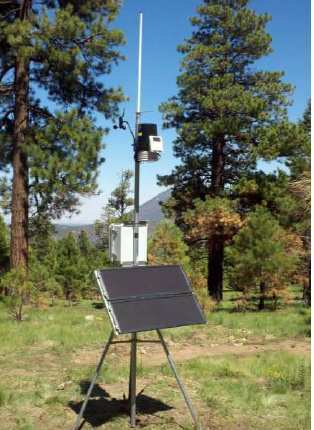 The National Weather Service is setting up flash flood alert systems for residents downslope from the recent Wallow wildfire [right] and last year's Schultz fire near Flagstaff. The Flash Flood Decision Support Pages provide live displays of weather radar, rainfall gauges throughout the burned areas, and alerts. County and federal officials are struggling with ways to mitigate flooding and debris flows but there are no easy or cheap answers. The problems of alluvial fan flooding are described in a companion story. The Flagstaff communities of Timberline and Doney Park were surprised last year when hundreds of homes on the slopes below the Schultz fire were hit by flood waters. Flooding is going to be a problem for perhaps another 3-5 years until the upper slopes are revegetated and the soils can absorb rainfall. Meanwhile, the nature of alluvial fans causes runoff to jump from channel to channel, from one wash to another, with any given storm. Small channels can become the main stream with no notice. Meanwhile, prison inmates are filling tens of thousands of sandbags to assist homeowners. Could Mississippi River floodwaters be channeled west to Colorado, New Mexico, and Arizona, freeing up Colorado River water to meet growing population demands? That's the proposal from Southern Nevada Water Authority chief Pat Mulroy the U.S. Chamber of Commerce. A story in the Las Vegas Review Journal says 350 million acre feet of water flows down the Mississippi in an average year, 25 times the flow of the Colorado. She argues that flood waters could irrigate crops in the Great Plains and West, leaving Colorado River water for downstream users in Las Vegas, Phoenix, and LA. [right, rivers of the U.S. Credit, National Map]. This would also presumably mitigate flooding in the central U.S.
Analysts say such a project would take decades and costs 10s to 100's of billions of dollars. "America is at a precipice. Sitting still is not an option. Our problems, while not hopeless, are urgent. And they require rediscovering something fundamental that we have lost: our shared sense of purpose..."
This is from the preface of a new book, "Adrift" by William Harris and Stephen Beschloss. Bill is CEO of Science Foundation Arizona. 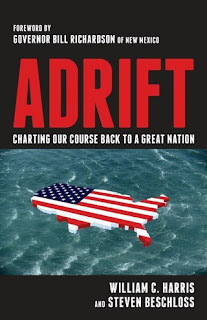 The book is receiving strong praise from a wide spectrum of elected officials, analysts, academics, and business leaders. I'm excited that Bill has put together his thoughts and vision. I've heard him speak to numerous groups and been in strategy sessions with him. I want to read this book. The Environmental Protection Agency is holding a competition for students to develop "green apps" to aid in environmental and public health protection. Winners of the "EPA Apps for the Environment" will be recognized at a national event in Washington DC. Details are at the EPA website - www.epa.gov/appsfortheenvironment. You can follow the conversation on Twitter - #GreenApps. Deadline for submissions is Sept. 16, 2011. The debate over uranium mining in northern Arizona continues to focus on fears of uranium entering the Colorado River. The Las Vegas Sun today editorialized, "Republicans should quit trying to roll back uranium mining moratorium." "Republicans in Congress should quit trying to repeal the moratorium and should instead work to protect the Grand Canyon and the Colorado River. 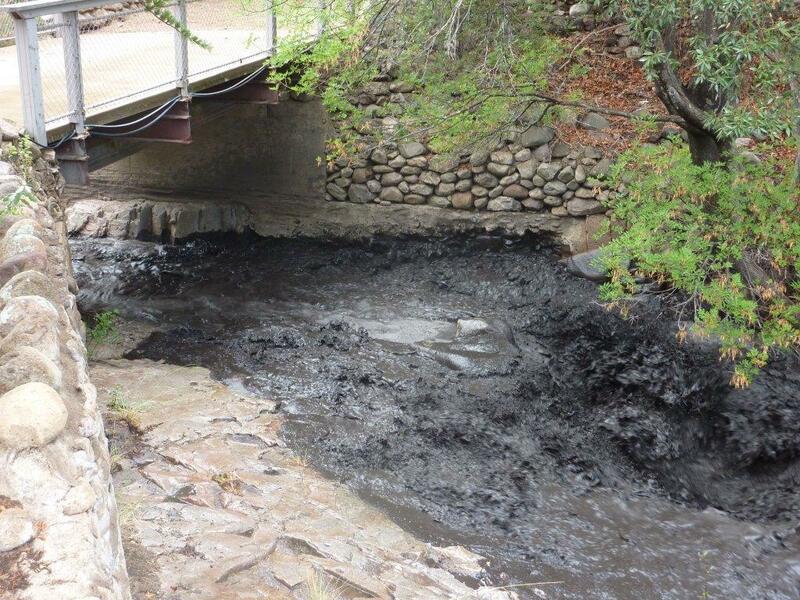 It makes no sense to put millions of people’s drinking water at risk." The presumption seems to be that the river is uranium-free now. However, a U.S. Geological Survey report issued in 2010, provided data showing that the river carries an average of 120,000 lbs (a range of 40-80 tons) of uranium down the Grand Canyon every year. 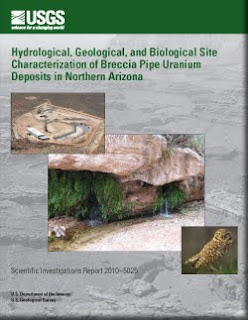 The uranium is apparently eroded from normal crustal concentrations over the large drainage area of the Colorado River basin. Do water managers fear that millions of people's drinking water is currently at risk from the tons of uranium being carried naturally by the Colorado River? Freeport McMoRan Copper & Gold reports net income for the 2Q of 2011 of $1.4 billion, more than double that of $649 million, a year ago. The increase is due to a combined increased in production of copper, gold, and molybdenum and price increases for the metals. The company said "Consolidated sales from mines for second-quarter 2011 totaled 1.0 billion pounds of copper, 356 thousand ounces of gold and 21 million pounds of molybdenum, compared with 914 million pounds of copper, 298 thousand ounces of gold and 16 million pounds of molybdenum for second-quarter 2010." 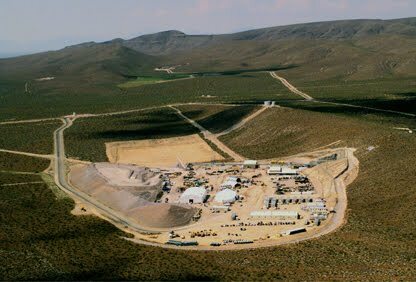 At Morenci [right, my photo, May 2008], FCX completed its project to ramp up mining rates to 635,000 metric tons of ore per day and milling rates to approximately 50,000 metric tons per day, resulting in an increase of 125 million pounds of copper per year. FCX is advancing a feasibility study to expand mining and milling capacity at Morenci to process additional sulfide ores identified through positive exploratory drilling over the last few years. This project, which would require significant investment, would increase milling rates to approximately 115,000 metric tons of ore per day and target incremental annual copper production of approximately 225 million pounds within three years, following completion of the feasibility study, expected by year-end 2011. The ramp up of mining activities at the Miami mine continues. 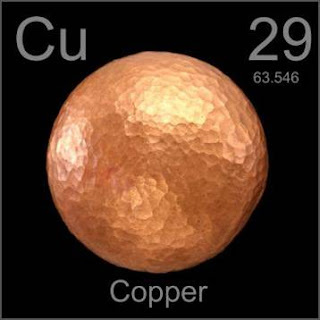 FCX expects production at Miami to ramp up to approximately 100 million pounds of copper per year by 2012. 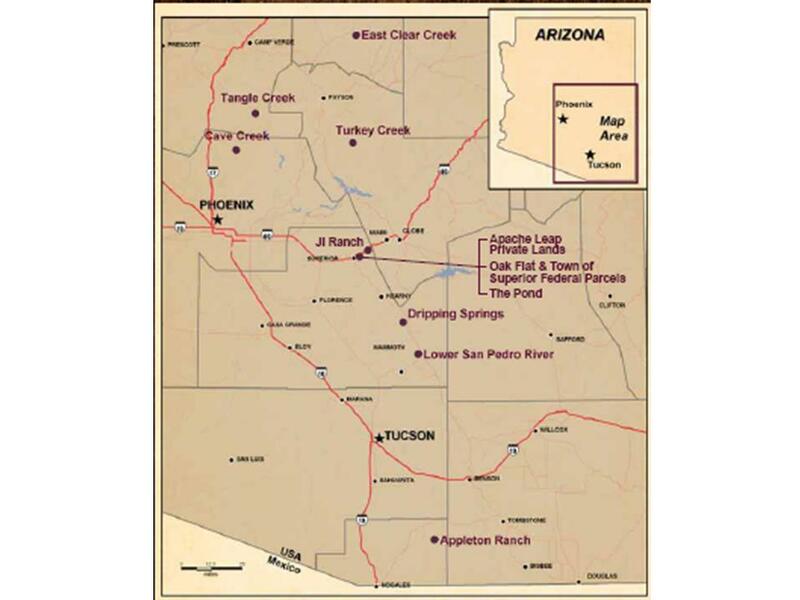 Two companies have added a total of nine more core holes to their potash exploration programs in the Holbrook basin of eastern Arizona. 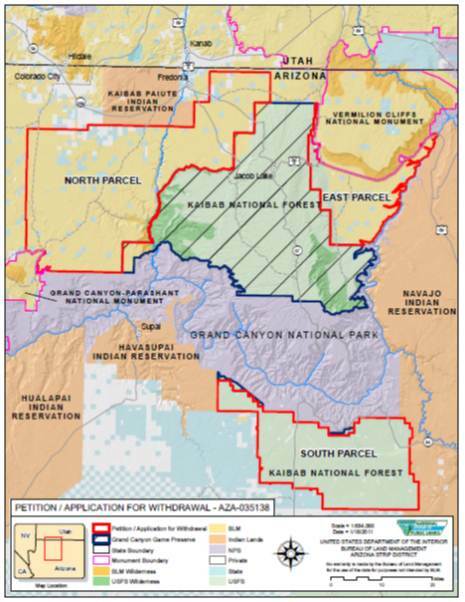 Southwest Exploration/Passport Potash had 4 drilling permits approved by the Arizona Oil and Gas Conservation Commission this week; HNZ Potash had 5 permits approved. STORM PATROL RESPONDS TO CLOGGED FOREST ROADS Sierra Vista, AZ (July 21, 2011) – One of the treatments approved for the West Coronado Burned Area Emergency Response (BAER) team is storm patrol. This treatment consists of equipment operators entering the burn area during a storm (if safe) or immediately after a storm event to clean out culverts, reestablish low water crossings and maintain other treatments that have been implemented to protect road infrastructure and reduce the potential for watershed degradation. Justin Michael is a Forest Service motor grader who has been called upon to clear roadways impacted by the Monument Fire twice. “I cleared low water crossings on Miller Canyon Road after the recent flood so people could make it out of their homes,” said Michael. 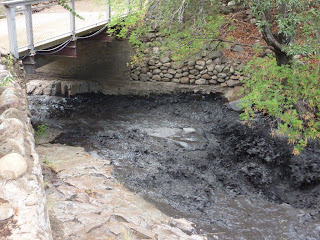 “There was so much sediment mixed with boulders and logs all piled up that it looked like a beaver lodge had been built right there on the road.” Michael also cleared Forest Service Road 61, or the Montezuma Pass Road, just the week before when a flow originating in Copper Canyon made the road impassable. The road is heavily used by the Border Patrol. The patrols are used to identify road problems such as plugged culverts and washed-out roads after flooding and to clear and repair any road receiving severe surface erosion. In other Monument BAER news, team engineers continue to identify road locations at risk for storm damage. For example, low water crossings may need to be constructed in places where existing culverts are likely to fail when debris accumulates and starts to dam due to flooding. The public is invited to visit the InciWeb site at www.inciweb.org, for the latest information including maps, news releases, and photos of the fires assessed by the West Coronado BAER team. I was in Phoenix today for meetings and to give talks on geologic hazards to the annual meeting of the Arizona Emergency Services Association, which put me on the road home to Tucson late this afternoon when monsoon storms and winds were gearing up. Just south of Phoenix, there were too many dust devils to count. At Casa Grande, the midway point on the drive, parts of town were disappearing under dust clouds, that also engulfed sections of I-10, limiting visibility to about 1/4 mile. Another dust storm, smaller, but less visibility, south of town, and the last of three as I neared Picacho Peak. On top of that the temperature in Phoenix was 114. Tucson felt balmy at 97. And I can't even say it was a dry heat, because of the monsoon humidity. Here's another video of recent Phoenix-area dust storms (not one that I drove through today however). AZGS recently set up an online store at Amazon.com and now we have our first electronic book available for the Kindle. 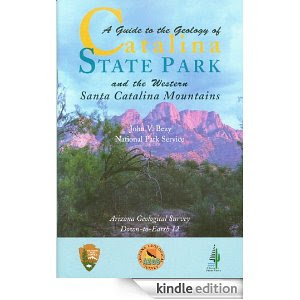 "A Guide to the Geology of Catalina State Park and the Western Santa Catalina Mountains," (Down-to-Earth-12) [Kindle Edition], by John V. Bezy with photos by Larry D. Fellows can be purchased for only $1.99. Watch for many more of the AZGS Down to Earth series to come out as e-books. 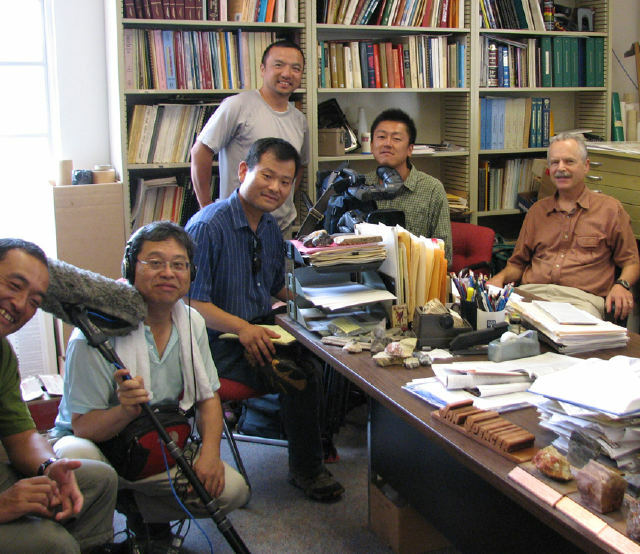 A film crew from the Japanese tv network NHK was in the AZGS offices today in Tucson, interviewing Chief Geologist Jon Spencer [far right. Photo credit Mike Conway] about the role of geology in creating and influencing the nature of the Sonoran desert. A theme of the documentary is to explain why the American Southwest deserts are so different from others such as the Gobi and Sahara deserts. The legal consolidation of the Arizona Dept. 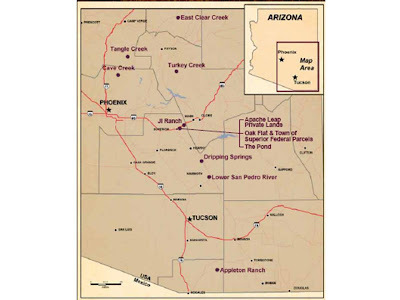 of Mines and Mineral Resources with the Arizona Geological Survey became effective today. It was largely a non-event. AZGS took over management of the Mines Dept. assets in January when that agency ran out of funds. The staff were hired by AZGS and maintained most of their previous duties while the Legislature and Governor approved a formal consolidation. During our temporary custodianship, we made major progress in integrating accounting and finance systems, upgrading the ADMMR computers and network, carrying out a complete inventory of ADMMR assets, and transferring remaining external contracts to AZGS. We now want to find more suitable (and publicly accessible) offices for the combined AZGS and ADMMR staff in Phoenix to establish a full-service AZGS branch office in the Phoenix valley to better serve our customers and stakeholders. Friends and colleagues driving between Phoenix and Tucson have been reporting thick dust storms since Sunday. But yesterday Phoenix experienced another massive haboob, perhaps not as dramatic as the one that rolled through a couple weeks ago, but still impressive. This video is by Mike Oblinski, as posted on CNN's ireport web site. update 7-18-11 1pm: I edited this post to remove excerpts of a press release by an exploration company because some readers interpreted it as an endorsement. We had a magnitude 2.2 quake south of Lake Mead this morning at 7:34 am local time. The event was about 23 east of Boulder City, Nevada. There have been a number of similar quakes in this region throughout the spring and summer so far. Canada drops state-registered geologists as "qualified persons"
The AIPG newsletter this month reported that the Canadian Securities Administrators (CSA) "has shortened its list of recognized foreign professional organizations" that meet the definition of "qualified person" under National Instrument 43-101, so that "Licensed or registered geologists by US states are conspicuously absent." Basically, they deleted the designation of ASBOG certifications in the regulations appendix on "Accepted Foreign Associations and Membership Designations." Yet, U.S. state registered engineers are still eligible to be qualified persons. AIPG notes that U.S. geologists who want to serve as qualified persons, can qualify with AIPG Certification. The Arizona Dept. of Water Resources has its subsidence maps online in an interactive viewer. There are multiple time intervals for each of 16 subsidence intervals. 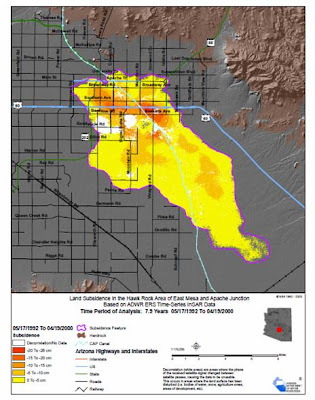 The map below shows the Hawk Rock (East Mesa - Apache Junction) area, from May 1992 to April 2000. The ADWR subsidence program is seeking contributions from other government entities to try to continue subsidence monitoring in light of significant budget cuts to the agency. Science Foundation Arizona is more than tripling state investments in job and business development in science and techology arenas. During the first three years (2007-2009), the state allocated $77.6 million for matching fund investments from the private sector, of which $63.4 million has been invested in university and nonprofit research funding initiatives. 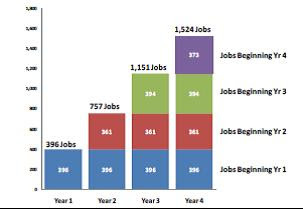 By the end of 2010, return on investment was more than 3-to-1, generating an additional $199.5 million in funds from industry, Federal, venture capital, and other sources, boiling down to $3.15 for every $1 invested by the state in research." The U.S. House Natural Resources Committee approved the land exchange bill needed by Resolution Copper to move forward in development of what could be the largest copper producing mine in North America. The underground mine is projected to provide as much as 20% of the U.S. demand for copper for 40 years and generate billions of dollars in revenues. We all know Tycho crater on the moon but you've never seen the central peak in such amazing detail. 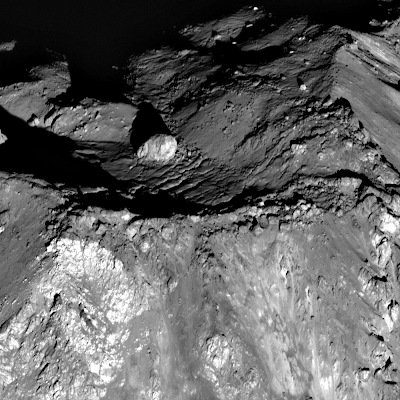 Check out the ASU LROC site to see the photo at right in perspective. "Arizona State University researchers have released a stunning image of the Moon’s prominent impact crater Tycho, taken with the Lunar Reconnaissance Orbiter Camera (LROC) on 10 June 2011. This dramatic sunrise view of Tycho crater captured by Professor Mark Robinson’s LROC team with the narrow angle camera could be considered one of the most beautiful images of the Moon taken to date." "The relatively young Tycho is the most conspicuous crater visible when the Moon is full. It is a very popular target with amateur astronomers because it is surrounded by a distinctive dark halo and radiating bright rays. 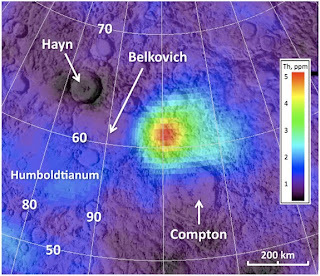 Located in the southern lunar highlands at 43.37°S, 348.68°E, the approximately 82-kilometer (51 miles) wide Tycho crater fits the mold of a typical large complex impact crater with its flat floor, terraced inner-rim walls and prominent central peak. The summit of the central peak is 2 km (6562 ft) above the crater floor, and the crater floor is about 4700 m (15,420 ft) below the rim. Many "clasts" ranging in size from 10 meters to 100s of meters are exposed in the central peak slopes." 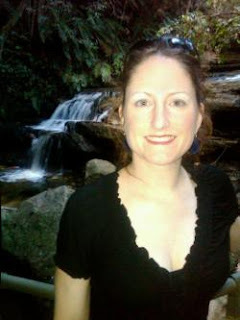 Amanda Clarke, a volcanology professor at ASU, recently received the 2011 Wager Medal from the International Association of Volcanology and Chemistry of the Earth's Interior (IAVCEI) July 4 in Melbourne, Australia. The medal is given every two years to one scientist under the age of 43 who has made outstanding contributions to the study of volcanology, particularly in the eight-year period prior to the award. Renowned planetary scientist/astronomer Tom Gehrels [right, credit UA] passed away in Tucson on Monday at the age of 86. The University of Arizona posted his obituary online and there is another version on Wikipedia. "Gehrels was among the first members of the fledgling Lunar and Planetary Laboratory when he joined the UA in 1961. 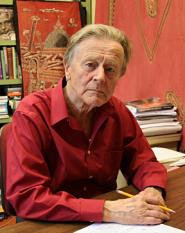 During a long and distinguished career Gehrels pioneered new research on asteroids and comets, especially those that pose a collision threat to Earth." He is credited with discovering several comets and being a member of a small team that discovered more than 4,000 asteroids. I have numerous volumes on my shelves of the UA Press's Space Science Series of textbooks, that Tom founded and edited. "More than a half-million sandbags are now in the flood area, and large concrete barriers sit around 160 homes," according to Andy Bertelsen, Coconino County public works director as reported in the Arizona [Flagstaff] Daily Sun. 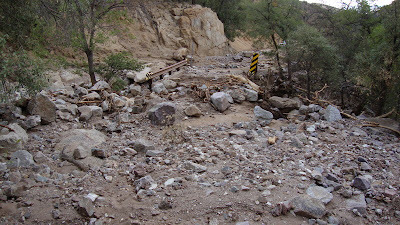 The Sierra Vista Herald is running a few photos of the flood deposits coming down Miller Canyon in the Huachuca Mountains, near the town of Sierra Vista. The area was severely burned by the Monument fire, eliminating vegetation that normal slows runoff allowing it to soak in. 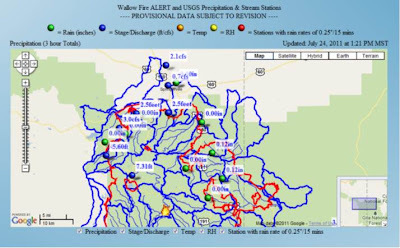 In addition, AZGS geologist Ann Youberg is quoted in a second article about Sunday's flash floods in the area following heavy monsoon rains. Joe Austin, owner of the El Coronado Ranch on West Turkey Creek, in the Chiracahuas, lives downslope from the Horseshoe II fire. He forwarded this photo [right] of the bridge by their house following a light rain on Monday. Heavier rains fell in the area on Sunday. You can see the how dark and muddy the water is. Meanwhile, there are news reports of serious damage to four homes in the Miller Canyon area on the east side of the Huachuca's downslope of the Monument fire and efforts by residents to sandbag against more floods. update 7-11-11, 08:47: the Sierra Vista Herald published a long story with more details this morning. We have a report of 'serious' flooding in Miller Canyon in the Huachuca Mountains, causing 'substantial' damage to two homes. 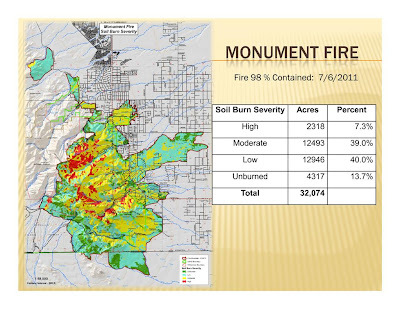 The area was burned in the Monument fire. 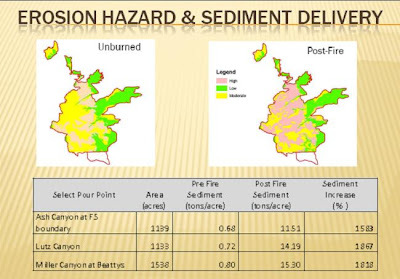 Miller and Ash canyons were identified as having high potential for post-fire flooding and debris flows. 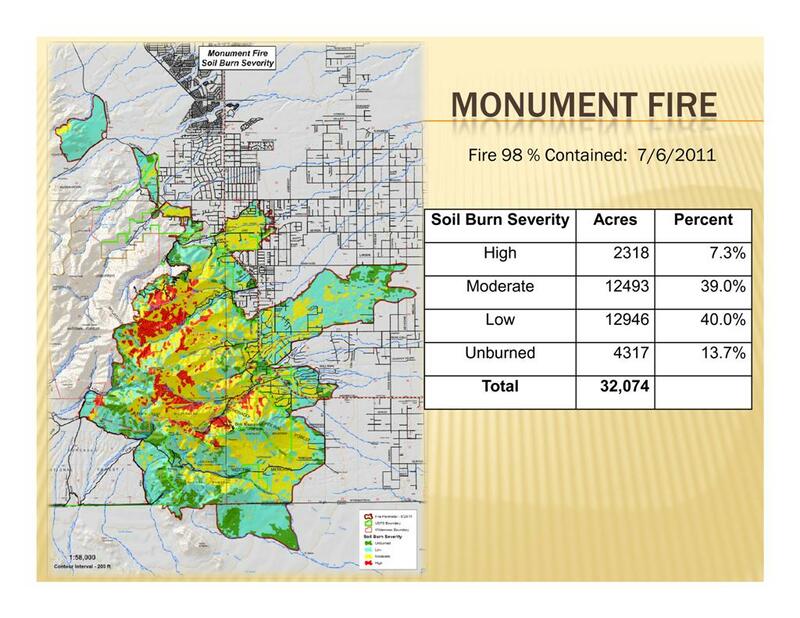 Forest Service officials are warning that heavy monsoon rains in the Huachuca Mountains southwest of Sierra Vista, could carry "mud, debris, and boulders" down canyons denuded by the Monument wild fire. Rain gauges were installed Thursday and Friday to give residents a warning when heavy rains could trigger flooding. In addition, we hear that two permanent ALERT raing gauges have been set up in the Monument fire area. The weather data from these units is communicated in real-time via amateur radio automatic packet reporting system (APRS). The weather data APRS packets are typically transmitted every 10 minutes. These weather stations will be monitored by the National Weather Service and used to issue weather watch and warnings to nearby communities and recreational areas. Residents are encouraged to use extreme caution when traveling in the vicinity of the Horseshoe 2 fire area. Monsoon rains on burned slopes will result in large flood events, debris flows, rolling rocks, and falling trees - all of which could block vehicular travel. Travelers need to use caution when driving on roads downstream from the fire area and to avoid crossing swift flowing water. Landowners living downstream from the burned areas need to be prepared to have their egress routes blocked and should have supplies of food, water, and clothing to be self-sufficient for several days until roads can be re-opened. Remember, it does not need to be raining where you are for a flash flood to occur.